Above: Photo by Miranda PowellSome of the brightest minds in astrophysics are like undiscovered exoplanets. They are out there, but no one knows about them just yet. For some of these students, no one in their family has ever gone to college, let alone measured the masses of neutron stars. Fates and circumstances haven’t aligned with their talents. The trick is seeking such people out, and then mentoring and encouraging them. After all, “many talented students have had fewer opportunities than their wealthy peers,” says UC Santa Cruz astronomy professor Enrico Ramirez-Ruiz, who has made it part of his life’s work to recruit, nurture, and champion such students. When Ramirez-Ruiz launched the Lamat Summer Research Program on High-Performance Computing in Astrophysics in 2009, he was throwing out a wide net, hoping to snare the most talented community college students, as well as current UC Santa Cruz students, and make them part of the astrophysics community. The Lamat program also places a special emphasis on attracting Latinx students who are skilled in the sciences but want to delve more deeply into research. 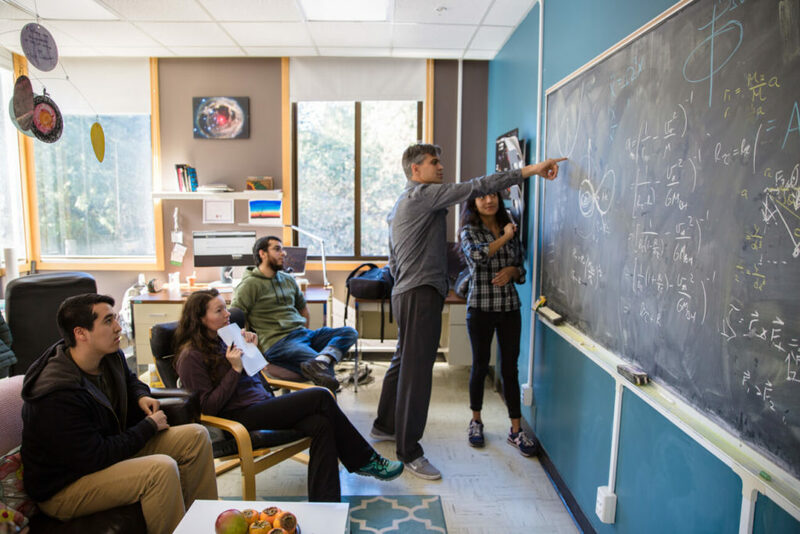 Many Lamat students are transfers from community colleges; others have been at UC Santa Cruz all along but were looking for an immersive program to ramp up their astrophysics skills. And the results, so far, have been remarkable. Ramirez-Ruiz has an outsized pride in every one of these students, who truly live up to the program’s name. “Lamat” means “star” in the Mayan language. And the program has yielded a phenomenal statistic: Lamat-trained UC Santa Cruz alumni helped increase the number of Latinx students in top astronomy graduate programs across the country from 2 percent to 5 percent in seven years. At 39, Andrea Antoni (Kresge ’18, astrophysics) is more than a decade older than many of her cohorts in the astrophysics program at UC Santa Cruz, but the long deferment of her ambitions has, if anything, redoubled her focus. “She is probably one of the best students we have seen in our program,” said Ramirez-Ruiz, noting that she has had graduate school offers from Harvard, Princeton, UC Berkeley, and Caltech. She was also the recipient of a prestigious 2017 Goldwater Scholarship for undergraduates in the fields of mathematics, science, and engineering and earned a 4.0 GPA. While attending West Valley College in Saratoga, Antoni found out about “STEM Transfer Day,” in which community college students can learn about opportunities at UC Santa Cruz. 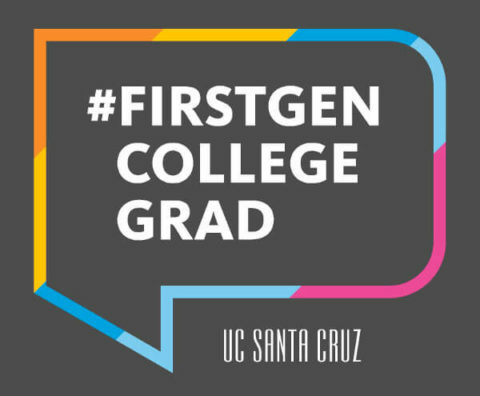 That’s how she first heard of Ramirez-Ruiz, her future mentor, and learned that UC Santa Cruz is one of the few remaining campuses in the UC system to offer guaranteed admission for qualified community college students. On campus, she picked up a Lamat program flyer, applied, and was accepted into that scientific “boot camp.” The experience was a revelation. She also realized that her research and classroom work reinforced each other in surprising ways. “Banging my head against the wall and putting wildly different physics concepts together to solve real problems really primed my ears for thinking in the classroom,” she noted. Antoni was born in Cincinnati, but the family moved to the Bay Area when she was 5. Her mother was a waitress at Red Lobster. Her father hung drywall. But Antoni had to miss part of high school because of problems at home. After she became a single mother at 18, on her last day of high school, she went to work at Togo’s, initially as a sandwich maker, but ended up a graphic designer and serving as the brand director for the company’s Aqui Cal-Mex division. With help from a supportive partner, and while her daughter was still in high school, Antoni completed the transfer requirements for a physics major before coming to UC Santa Cruz. Though Antoni has worked very hard on campus—and she and her sister are the first in their family to go to college—the years have passed like a dream. “I get paid to do science!” she says, referring to her grant money. Antoni plans to begin at UC Berkeley this fall to pursue her Ph.D.
Clearly, Lopez has a lot to be grateful for. He has gone from failing community college to pursuing a Ph.D. in astrophysics at Harvard starting in the fall of 2019. His transformation from a struggling student to an outstanding scholar was, literally, a matter of faith. Lopez, a New Yorker and a first-generation college student, did not give much thought to school or the sciences when he graduated from high school in 2008. He enrolled in a community college, but mostly to please his parents. After dropping out with a GPA of 1.1, he moved to San Jose to enroll at an art institute and pursue a career in video games, only to be told that he could not draw and should seek another profession. In fact, excelling at school became an act of worship. After transferring to UC Santa Cruz, he was accepted into Lamat, an impressive feat in itself. In a typical year, Lamat receives hundreds of applicants for only a few positions. But for those determined few, the program came with full funding for summer research throughout their careers at UC Santa Cruz. For Lopez, the program also led to an invitation to join a research group with Ramirez-Ruiz, who pushed the students to think critically, even while bolstering their confidence with strong support. “Lamat was my first real exposure to astrophysics and any idea of how research worked or how to do it,” Lopez said. “I didn’t know how to read a paper, how to search for papers, or even know what the point of reading them was.” As for Ramirez-Ruiz, “he pushes all of his students to think critically and believes in us,” Lopez said. “He believed in me as a student with no background whatsoever and no research skills and helped me and mentored me through my journey at UC Santa Cruz.” Aldo Batta, a postdoctoral scholar, also guided him throughout his time at UC Santa Cruz. For Monica Gallegos-Garcia (Oakes ’18, astrophysics), the Lamat summer program was her first real exposure to astrophysics research—and posed a formidable challenge in the beginning. She was a first-generation college student, and it took a little while just to find her footing in academia. “Many times, I would stay on campus working for late hours because I was stuck on a problem,” says Gallegos-Garcia. But all that hands-on research experience would be a boon for Gallegos-Garcia, who has decided to attend a Ph.D. program in astronomy/ astrophysics at Northwestern University. Gallegos-Garcia is first author of a paper entitled “Tidal Disruptions of Main-sequence Stars of Varying Mass and Age: Inferences from the Composition of the Fallback Material,” which was published in the Astrophysical Journal this year. Krystal Ruiz-Rocha (Stevenson ‘16, physics) plans on continuing research in astrophysics and pursuing graduate studies. This coming year she is going to participate in the renowned Fisk-Vanderbilt Bridge Program. A Salinas native, she is the first in her family, on her father’s side, to attend college, and the first to pursue a STEM field. And yet her connection to the sciences was strong, immediate, and unbreakable even when she was a child. In Lamat, “I learned a great deal more about research practices and methods, and how to explain complex topics to my peers and people with no knowledge in astronomy,” she says. In fact, it was Lamat that gave her the tools to understand the workings of the universe, and motivated her to major in physics. Lamat also exposed her to students from diverse backgrounds—something that was sorely lacking in her physics classes, she said. 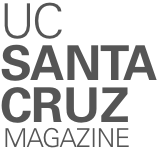 After graduating from UC Santa Cruz two years ago, Ruiz-Rocha continued her work on campus; her mentor, Ramirez-Ruiz, hired her as a junior research assistant. In the process, Lamat is doing more than just preparing these students for success. For more information, visit stemdiv.ucsc.edu/lamat.